Before going deep into Investment Models, let’s analyse another basic aspect : What is investment? Investment has slightly different meanings in economics and finance, but a combined definition can be as “Investment is the process of putting money in assets for increasing production or financial gains“. Yes, investment is all about putting money in assets. And, the investment models speak about how to put the money in assets. For a first hand understanding on investment, consider it as putting money in banks deposits, shares of companies, real estate, gold, business or industry. For a country to grow (and generate employment opportunities to all), it should produce more goods and services, and hence investments in business, agriculture or industry or supporting infrastructure is highly appreciated. If government has sufficient funds to invest in these areas, then it seems well and fine, but a nation like India with a Fiscal Deficit of 5.1% of GDP cannot ask Government to take care of all investment needs. The investment should come from private players too and that’s a win-win situation for all! Investment is a function of Income and Rate of Interest [I=f(Y,r)]. Higher the income, the more will be the investment; higher the rate of interest the lesser will be the investment. More Income->More Savings->More Investment->More Income. Also : No investment->No Growth->Poverty, Malnutrition, Unemployment etc. So for more income, we need more investment. Which are the modes by which Investments can be attracted? Money for investing in productive assets can be from Public Sources (Government), Private Sources (Corporate) or Combined Sources (Public Private Partnership or PPP). Thus one the basis of who invests in assets for increasing production, there are three major investment models. Public Investment Model: For a government to invest, it needs revenue (mainly tax revenue), but the present tax revenues of India are not sufficient enough to meet the budgetary expenditure of India. So India cannot move ahead in the path of growth without private individuals; even for government to have a share in the investment, they need tax revenue from the private investors. 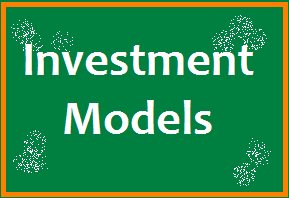 Private Investment Model: The private investment can come from India or abroad. If it’s from abroad – they can be as FDI or FPI. (Details will be discussed later.) As India’s Current Account Deficit is widening due to increased Oil Import, in this age of globalization, we cannot say NO to FDI or FPI. Why private investment in India: For a country to grow and increase its income, the production has to be increased. More goods and services has to be produced. Infrastructure to support production – transport, energy and communication – should also be developed. But how can a nation with near 30% of population below poverty line, invest in production or infrastructure? Who has money to invest? Government? Again, depending from where investment comes, there are two other investment models. Domestic Investment Model – It can be from Public, Private or PPP. Foreign Investment Model – It can be 100% FDI or Foreign-Domestic Mix. Sector Specific Investment Models (In SEZ or MIZ etc). A road can be constructed by adopted different models. Let’s analyze a few cases to understand the concept. Case 1: Government machinery and funds are directly used to construct a road. No intermediaries or third parties are involved. —>Disadvantage: Government needs money to start the project. Case 2: A bid is placed for the road work contract. Usually a contractor or company with lowest bid gets the project. Government sanctions funds in part or full, depending upon the completion of stages. Case 3: Government spends no money from its pocket, but asks a company to construct the road. (No private firm will engage in constructing roads in a country unless they get returns for it – You know that!) Government offers to collect toll fees from the road for a fixed period of 10 or 15 years until they recover their cost and decent profit. —> The benefit of this approach is that without spending any amount from Government’s pocket, the nation will get a road. Toll charges in addition to tax paid is a matter of concern, but it’s better than the case with no road or poor road with traffic congestion. Hope it’s clear by now that capital formation is necessary for any country to grow. But the process is not easy. The savings rate in India is now near 30%. Percapita Income of Indians is very low and hence the capital available for investing too is low. Investments should be studied from three angles – Households, Corporates and Government. Investments expect a return – be it from Government side or Private side. Though the return on investment in terms of profit or margin is the main motive behind investments, its effect on the welfare side and development should not be neglected. To add in the favorite terms of UPSC – investments should help in inclusive, sustainable development. Harrod Domar Model : The model implies that economic growth depends on policies to increase investment, by increasing saving, and using that investment more efficiently through technological advances. It suggests that there is no natural reason for an economy to have balanced growth. It was more or less a One Sector Model. —>Failed to attract investment on consumer goods in India as we lacked good capital goods industries. Solow Swan Model : The neo-classical model was an extension to the 1946 Harrod–Domar model that included a new term: productivity growth. Feldman–Mahalanobis model : A high enough capacity in the capital goods sector in the long-run expands the capacity in the production of consumer goods. Thus the essence of the model is a shift in the pattern of industrial investment towards building up a domestic consumption goods sector. It was a Two Sector Model which was later developed into Four Sector Model. Also known as Nehru-Mahalanobis model. Rao ManMohan Model : Policy of Econmic Liberilization and FDI initiated in 1991 by Narasimha Rao and Dr.Manmohan Singh. Lewis model of economic development by unlimited labour supply. Saving led growth model. — Significance to India. Tax Rate in the country. (Net income available after tax). Rate of Interest in Banks. Possible Rate of Return on Capital. Availability of other factors of production – cheap land, labour etc and supporting infrastructure – transport, energy and communication. Investment friendly environment in the country (policies of the government). India’s private-led overseas investment model has lessons for China. Discuss. Compare Gujarat model of development with Kerala model of development. What are Special Purpose Vehicles (SPVs)? Explain the significance in Indian context. Analyze the scope of philanthropic investment models in Indian perspective. If you have any comments, additions or relevant points regarding this article, please share them using the comment space below. Thanks! – ClearIAS.com. Excellent description you have given. And You could also written a single line about BOT, BOOT, and all. The pattern of asking questions is about the impact of different models on various sectors and also pros and cons or failures in india and not what they are.This is for very basic understanding. You can write an answer about the impact of different models on various sectors and also pros and cons or failures in india and not what they are only when you go through the materials for very basic undersranding*.